The latest jobs report released last week revealed a net improvement of 88,000 non-farm jobs nationwide and a decline of 0.1% in the jobless rate to 7.6%. To call this a disappointment is understatement. Are these really good indications for the strength of the economy? It’s becoming increasingly clear that all we’ve done over the last five years is pave over the potholes with money; but we haven’t fixed the road. 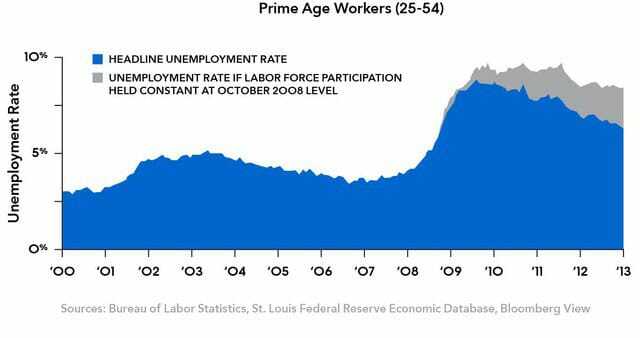 Nevertheless, pundits are spinning the number to show the positive impact Quantitative Easing has created for working class America. The numbers, however, show something else; the “new normal” of 2% annual growth. With jobs (at least ones that can be counted) ever elusive, the true strength of fiat currencies is undergoing real-time stress testing. Economies around the world are seeking to stabilize their currencies, even while confronted with a collapsing Euro and an over-valued, underperforming dollar. This past week, Japan announced that they would strengthen their own program of quantitative easing, but what they call “strengthening” of monetary stimulus we call “weakening” of a currency. Like the U.S. jobs report, it’s why we must take all information with a healthy dose of skepticism. The reality: Fewer and fewer people are bothering to look for a job. In fact, the participation rate in the job market has now reached its lowest level since 1979. With more Americans abandoning attempts to participate in the formal economy, an increasing number have taken to alternative means of employment, putting themselves back to work as consultants, day laborers and maids, to name a few. Some have organized time banks where they simply swap hours to get the services they need. And in doing so, they’re discovering that true value is not to be had in paper but in confidence. Are you confident that your current investments will maintain their momentum? Have you created alternative routes to protect your assets? Taking possession of physical gold and silver can do just that — and now is the time to get in. If you don’t have your money in your hand, you don’t have it. Call us today. BRICS continue to dump the Euro in favor of… gold? Their own currency?